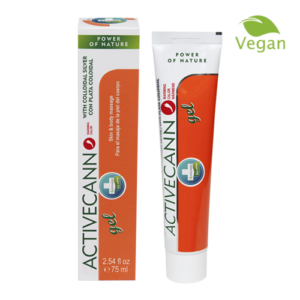 Activecann COLLAGEN for adults, especially for athletes and the elderly. 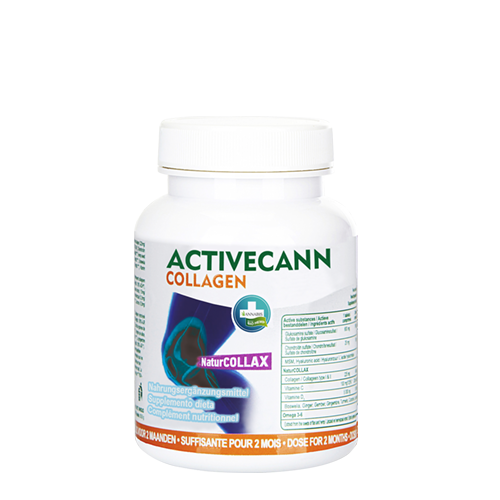 Activecann COLLAGEN is formed by the NaturCOLLAX complex in conjunction with glucosamine sulfate 2 KCl, chondroitin sulfate, MSM and hyaluronic acid. The complex NaturCOLLAX contains a certified type I collagen, type II collagen, vitamins C and D₃, ginger, boswellia and turmeric. Collagen is one of the basic components of articular cartilage. Vitamins C is necessary to preserve the normal development of bone and cartilage. Important parts of Activecann COLLAGEN are Omega 3-6 unsaturated fatty acids from the flax and hemp seeds. The package contains a dose for 2 months. Recommended dosage: One tablet daily. Suitable for long-term use. For best results use continually for at least 2 months. Warning: keep out of the reach of children! Do not exceed the recommended dosage. Product is not intended as a substitute for a varied diet. It is not intended for children under 3 years. Store in a dry and dark place at 10-25 °C. Protect the product from sunlight.